Original 1st/only printing 17 x 22&1/8" concert poster for the 6/2-4/1978 Lighter Than Air Fair at Grouse Mountain in Vancouver, B.C., Canada. 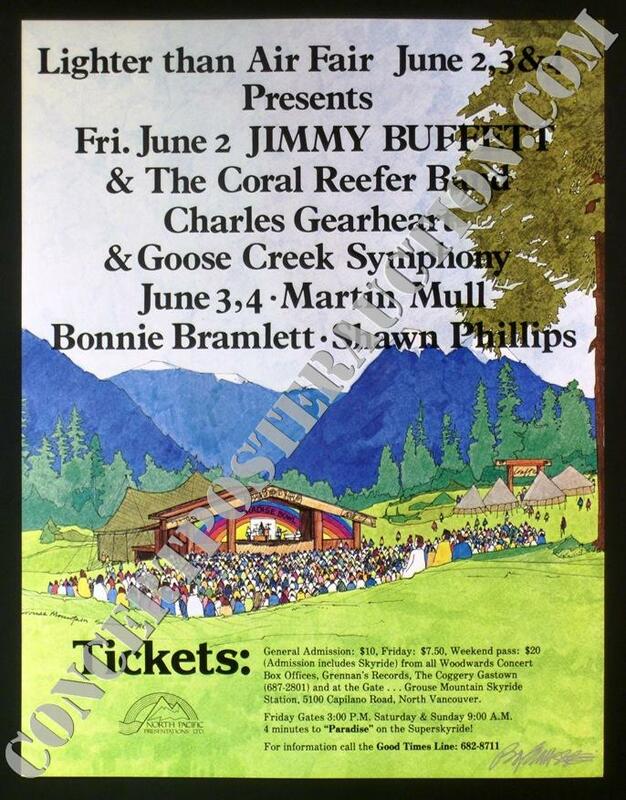 Art by (and signed in silver ink by) Bob Masse, the festival was headlined by Jimmy Buffett and the Coral Reefer Band with Charles Gearhart, Goose Creek Symphony (6/2), comedian Martin Mull, Bonnie Bramlett and Shawn Phillips (6/3-4). Medium-thick glossy stock poster is in sparkling mint/near mint (A/A-) condition, a very clean example. A sublimely pastoral mid-period Bob Masse poster for an unusual event with a real eclectic lineup. Super uncommon Jimmy Buffett item as well.